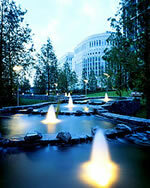 For each of the past 5 years, Canary Wharf Management has bought our Viresco™ Aqua for use as an algae control product in their Jubilee Ponds at the Canary Wharf site in London. Algae bloom had previously been a problem but since its initial application, Viresco™ Aqua has successfully kept algae bloom at bay in these ponds. On the last day of June 2008, the National Galleries of Scotland bought for their "Landform Ueda" pond complex on the site of the Gallery of Modern Art in Belford Road, Edinburgh a quantity of Viresco™ Aqua to control a severe outbreak of blanketweed. We were informed that prior to the use of Viresco™, the blanketweed was so thick that it was “almost possible to walk across it”. Three separate applications of Viresco were made. On September 6th, we saw the pond. and apart from a few green “wisps” in the water, the ponds were completely clear of blanketweed.